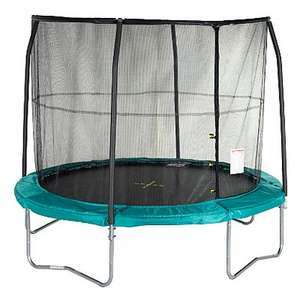 The UK's Best Selling Trampoline!!! Get bouncing this summer on the nations favourite trampoline! Trampolines are a great addition to your garden encouraging outdoor play and exercise, not to mention helping kids bounce off all their energy! Trampolining helps to improve physical development by increasing co-ordination, balance and strength. This trampoline comes all in one pack that includes the safety enclosure at a really affordable price. The safety enclosure prevents the jumper from bouncing on the springs and preventing accidental tumbles. The unique T-Connector on the frame has welded sockets for added strength. The safety enclosure has a G3 Shock-Corded Pole, this is a fibreglass rod which encompasses the top of the safety enclosure net for extra strength. Easy to assemble with full instructions included. This is a 2 person lift and build. Please call this number for any queries such as assembly assistances, concerns regarding missing and/or broken parts, or any other issues. poor reviews. I wouldn't buy again. the covers rip, so does the net as mine did. unfortunately the trampoline net has got 2 little holes. bought it last year £99 too! Good price and im after one at the moment but if the above review is anything to go by i may give it a miss. on the other hand ashmac has given a true view of how this item is rated..............shall i shant i?????? that should say I think, not u think!! Bought one for the same price 3 years ago and had no problems with it. Excellent quality. Bought this two years ago - it's been good, will recommend - had to repair the net a number of times (but that could be my kids! ), and the zip went after about 6 months, but it's still going strong. Steps were a bit steep (price wise! ), as the add on, and spikes to secure it weren't brilliant for the money, but the trampoline itself was, and still is excellent. My daughter is nearly 6 and there is no way I would put her on a trampoline without an enclosure!!! The net and pad on ours lasted about 3 years. Generic replacements last summer were about 70 quid. Then in the last storm one of the net supports got bent in half. Generally great though and I wouldn't go on one without an enlosure let alone let the kids do so. My daughter is nearly 6 and there is no way I would put her on a … My daughter is nearly 6 and there is no way I would put her on a trampoline without an enclosure!!! I don't think it matters which trampoline you get the net rots in 2 to 3 yrs and the pad over the springs goes soon after. It's the cost of replacements that counts, bearing in mind most generic nets come down to the outside of the springs. For this price you may as well buy a new one every 3 to 4 years. Our trampoline is similar to this and other than net and pad it's lived up to years of abuse very well, even the wife hasn't gone through it after 5 years unprotected in summer and winter. Poor quality wouldn't buy again. Only lasted 12 months better spending more and getting a better quality one. Bought one for the same price 3 years ago and had no problems with it. … Bought one for the same price 3 years ago and had no problems with it. Excellent quality. Same here. It's taken punishment from my now nine year old daughter, her friends and fourteen and half stone of me without collapsing. The only problem we have is we took it down to move home and the elasticated cord that holds the rods together at the top to support the netting snapped. I'm sure a trip to a camping website for replacement cord will sort it out. Otherwise well worth the money! they wont go up, we bought one last year and the price never changed from march to september. Not had any issues with ours seems well made, you can get parts for them if something breaks but for the price you are better off buying a new one and selling the bits you dont need. Bought in 2011 at this price. Has lasted 3 summers used by adults & kids! Two tips, instructions mentioned the padding may be missing & gave a number to call for replacement. I got one as I knew the one that came with the trampoline wouldnt last long (bit sneaky I know), secondly, the net may rip after a few years but dont go back to Jumpking for a replacement ( c. £85! ), go to ebay instead. Just fitted mine today, £40!! Excellent quality, so now ive got a trampoline which looks brand new again! bought this last year for the same price and very pleased with it. well worth the money and the kids love it still going strong after a year. Very poor quality net which cost £80 to replace. Avoid. Bought one from Asda on Tuesday. I have to say that for £99 it's really good. I dont see how people can complain. It went together with no problems and for a 10ft trampo with net for £99 it's cheaper than eBay (which is where the cheapest can usually be found). Jumpking as well which is a reputable brand. Only reason i had to buy a new one this year is that the one i got last year took off over the neighbours fence in the winter storms! I am a qualified gymnastics coach, I can assure you this is a fantastic product for the price. We bought this trampoline over 3 years ago for our teo boys ( now 4 and 8), it had no holes or tears until baby foxes came into our garden and destroyed the padding and tore the zip from the net. I was just hunting for a new one and to see if there was any better deals when I came across these reviews,anyone looking for a great deal on a good trampoline then this is it. No it won't last forever but neither do the £1000 ones either. Just bought. Thanks Op. +heat.